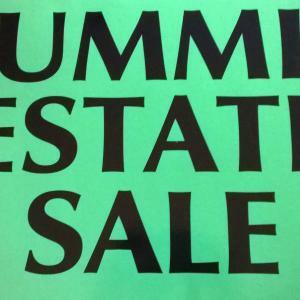 Summit Estate Sales is a licensed, bonded & insured professional corporation whose goal of maximizing your sale profits by increasing exposure and demand for your personal property, antiques, and collectibles is balanced with respect and understanding of your family history and memories. Our full turn-key estate sale service begins with a free consultation, then proceeds with our experienced sellers staging & merchandising your collectibles, marketing thru online & print medias, sale operations, and post-sale premise cleaning & final liquidation of items. There is never an upfront fee-we're strictly commission only which keeps us motivated sellers. We have no antique or other business as we feel this would be a conflict of interest. Your business is our only business! Please contact Pat or Pam at 816-694-6824 or 816-785-7671 with any questions or to schedule a free consultation. Wonderful mix of Vintage Collectibles, Furniture, even Shop Supplies at this eclectic 4-Day Lee’s Summit estate sale on May 9th-12th. Stay tuned for details and photos! Wonderful mix at this charming Independence estate sale on May 22nd-23rd. Appliances, Furniture, and Decor Accents for starters. Sale Hours: 9am-3pm. Stay tuned for additional details and photos. Kansas City estate sale on May 30th-31st. Items include Workshop Tools, Quality Furniture, and Decor Accents-more details plus photo gallery to be posted closer to date, so keep checking back! Let’s just say this sale is full of surprises! Workshop Tools, Furniture, Collectibles, and full of surprises! Details and photos will be posted closer to date, so stay tuned! Consignment Collectibles and Artwork at this Kansas City sale event on Friday-Sunday from 10am-2pm. Details and photos to be posted shortly. Pop-Up 75% Off Independence Estate Sale-Hunting/Fishing/Lawn/Books/Collectibles/Furniture Sunday 10am-2pm! South Kansas City 75% Off Blow-Out Sale 9705 Leslie Avenue (Hwy 350/West Bannister) Sunday Only 10am-3pm! Pop-Up Independence Estate Sale at 15701 E. 43rd Terr on Sunday Only 10am-2pm! 50% Off! Holiday Gift Shopping Saturday from 9am-3pm at Kansas City MO Estate Consignment Shop! Clearance at Kansas City Estate Shop Sale at 14403 Little Blue Road (Noland & Little Blue Rd) on Saturday 9am-3pm! Dig these 1950s-60s Collectibles! Movie Posters, Aluminum Christmas Trees, Toys, Collectibles, Jewelry, More! 66% Off! Beautiful Lee's Summit Estate Sale-905 NW Cedar Creek Lane (View High Dr/East Chipman) Sun 9-Noon Art to Appliances! Incredible Sugar Creek Estate Sale-Rare Salesman Sample Road Grader, Primitives, Collectibles! This company has posted a total of 305 estate sales. Only the most recent 50 sales are shown.